What was the career path that led you to your current position? My first taste of archives was as a student at Smith College. We had a class visit to the college archives, and I remember being amazed by the collections there. I loved being able to read diaries from early students at the college, and to see ephemera such as dance cards that seemed a world away from my own experiences. The staff were so knowledgeable and welcoming, and I loved the working with the collections. I applied for a work study position in the archives and was given the best assignment ever – rehousing the Sylvia Plath papers. From that point, I was hooked! After graduating from Smith in 2002, I started at the iSchool (then known as SLIS) that fall with a concentration in Archival Administration. In the Spring of 2003, I completed a practicum at the Wisconsin State Historical Society, working on the Fred Halstead Papers relating to his anti-Vietnam War activism. At the time, I was struck by the parallels between the archival materials I was processing from 30 years earlier, and the organizing efforts and peace movement going on around me in Madison as the US prepared to invade Iraq. I didn’t realise it at the time, but that practicum was the start of a career path documenting social movements. My first position after graduating in 2004 was a project archivist role at the Benjamin L. Hooks Institute for Social Change, at the University of Memphis, where I processed 400 boxes of papers belonging to Dr. Hooks, a former director of the NAACP. When that position ended, after a few months of down time, I was hired to be the first Curator for Human Rights Collections at the Thomas J. Dodd Research Center at the University of Connecticut. In that role, I helped build the collections, conducted oral histories, and worked with the Human Rights Institute at UConn to support the human rights curriculum. In 2011, I left UConn and moved to New Zealand (where my wife is from). Eventually, a job opened up at the Alexander Turnbull Library, the department of archives and special collections within the National Library of New Zealand Te Puna Mātauranga o Aotearoa. 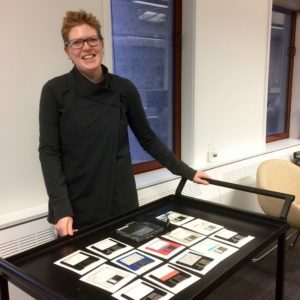 From 2012 – 2017, I worked as digital specialist on the Arrangement and Description Team, processing born-digital and hybrid collections, before moving into my current role as Senior Digital Archivist at the end of last year. As one of two digital archivists on staff, I work with the curators to acquire born-digital content, assessing files for any technical issues, and preparing them for ingest into the National Digital Heritage Archive (NDHA). And earlier this year, I officially became a New Zealand citizen. But beyond the technical aspects of the role, it’s really the core archival work that I love the most. It is our responsibility to create a documentary history that is inclusive of all New Zealanders, and that means collecting contemporary digital materials right now before they disappear. Recently, I worked on acquiring and processing a social media project where a collective of artists illustrated the experiences of over 250 welfare recipients in New Zealand in their own words to highlight common issues and challenges that beneficiaries face in their day to day lives. With consent from the project participants who had shared their stories and the artists involved, we acquired the original art files, as well as the behind the scenes administrative documentation. We also received downloaded archives from the project’s Facebook, Instagram, and Twitter accounts. As a result, the Library made connections with a new generation of artists and illustrators who had never engaged with the Library before, and helped document a community that was previously missing from the collections. How has your time at the iSchool influenced your career? The iSchool gave me a strong foundation in archival studies and information management, which has helped me in every role I’ve had. It also taught me the beauty of the phrase, “It depends,” which applies to archival work more often than not! While the technology and digital best practices have changed dramatically over that time, the fundamentals of archival theory, such as appraisal, provenance, and authenticity are more important than ever. Additionally, I got great work experience while I was a student at the iSchool, working part time in several libraries across campus, including the Primate Center Library, and in the rare books collection at Memorial Library. I also have fond memories of working the “late night” reference desk at College Library. What is your advice for current or future students? You don’t know what you don’t know, so always keep learning and looking for professional development opportunities. Conferences are great, but even just establishing a reading group of professional literature within your organization can help you stay active and engaged. Don’t be afraid to admit mistakes or change course when you need to. Saving files to gold CDs used to be considered good practice for digital preservation; now we know that it’s really not! Something I wish I had realised at the start of my career was that if you’re working with sensitive or confronting materials, it’s important to take care of yourself, and develop strategies such as mindfulness meditation, for example, to help separate yourself from that at the end of the day so you don’t burn out. Boundaries are important! And archival work is one of those jobs that never finishes – there’s always backlogs, there’s always more to collect, more to process, etc. So it’s important to take breaks when you need them, and be realistic about what you can achieve. Additionally, build and use your networks! I couldn’t do the work that I do without a community of practice to bounce ideas off of, and learn from others’ experiences. I use Twitter a lot to ask/answer questions, and just keep up with what other digital preservationists are up to generally. Even if you are working on your own, there’s still folks out there to help. There’s a saying in New Zealand, “He waka eke noa”, which essentially means, “We’re all in this together.” I find that’s especially true with digital archives, where colleagues around the world face similar challenges of scale of collections, resourcing, and the need to continually upskill. But those challenges also pose opportunities for innovation, and are one of the things that make this work so rewarding. Thank you, Valerie, for sharing your career story with the iSchool! Next post: Who inspired you to attend the iSchool?